Public diplomacy has taken its place in schools of international relations in the United States and other countries. Many members of the Public Diplomacy Council teach in these institutions. Moreover, the Council sponsors a fellowship for a graduate student from the American University to assist its outreach efforts. 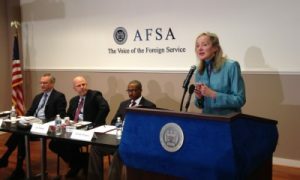 AU Fellowship: In partnership with American University, the Public Diplomacy Council offers an annual fellowship to students in AU’s interdisciplinary International Media program, a joint master’s program administered by its schools of Communication and International Service. As a PDC-AU collaboration, this fellowship represents the PDC’s commitment to engage further with the academic study of public diplomacy while encouraging the next generation of practitioners. University programs: Below you will find a selection of university programs and courses, mostly at the graduate level, that focus on diplomacy in the public sphere. Course descriptions: Our members have also supplied syllabi and descriptions of university courses that center on public diplomacy. Bruce Gregory’s Resources, compiled by this Council member, covers the periodical literature and books on public diplomacy comprehensively. We carry the latest edition and a link to past editions. Here is a list of the major degree programs in the field of public diplomacy, compiled by members of the Council who teach at universities in Washington. The Council is grateful for the assistance and coordination of PDC Volunteer Pauline Yang in the selection and editing.